When José David Ellner Romero heard the soldiers breaking down the door of the Globo radio station on the evening of the June 28 coup, he had a flashback. His mind conjured up the terrible images from the 1980s, when he was arrested by the military, thrown into an underground prison and tortured. “I couldn’t stand the thought of going through that hell again, so I got out on the ledge of the windowsill and jumped,” Elner told our International Emergency Delegation. His fractured shoulder, ribs and bruises were minor given that he jumped from the third floor. Galdamez, a single father, is under tremendous pressure. At night, he sees cars without license plates outside his house, rifles pointing out the window. He wants to leave the country, but doesn’t know where he and his children could go. By day two, most TV and radio stations were back on the air, but the National Telecommunications Commission (CONATEL) notified cable TV operators of a ban on broadcasting certain international TV stations such as Telesur, Cubavisión Internacional and CNN Español. 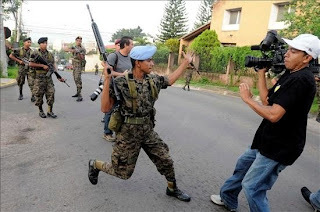 The pro-Zelaya Channels 36, 45 and 50 were also banned, their studios surrounded by soldiers. Another TV station not allowed to broadcast was Canal 66 Maya TV. "They've taken off the air everyone who does not support the coup," said Santos Gonzalez, a Channel 50 reporter. The owner of Channel 36, Esdras Amado Lopez, received threats that he would be arrested and went into hiding. A week after the coup, the station was still shut and surrounded by soldiers. The government-operated Channel 8, located inside the heavily guarded presidential palace, was taken off the air but was back in business on Wednesday—transmitting the new government’s propaganda. All of the TV stations are now decidedly pro-coup, devoting significant coverage to demonstrations in favor of the new government while ignoring or minimizing mass rallies supporting Zelaya. The Honduran people should have the right to know what their new leaders, in the name of democracy, are doing to destroy the very basic foundations of a democratic system—a free press. Medea Benjamin (medea@globalexchange.org) is cofounder of Global Exchange (www.globalexchange.org) and CODEPINK: Women for Peace (www.codepinkalert.org <http://www.codepinkalert.org> ). She is part of a delegation an International Emergency Delegation to Honduras that includes members of Nonviolence International, Global Exchange, CODEPINK and Rights Action. For more information or to join the delegation, contact Andres@nvintl.net. photo from Latin American Solidarity Coalition - visit them for more pics and info. These events are really interesting from a media point of view -- how media can choose a specific "reality" to shape the public. It's great, and courageous, that people are refusing to be passive about the situation. Reality is certainly a very subjective experience, and unfortunately, in the world we have created it is the powerful (and wealthy) who have dictated just what reality is. It certainly is refreshing to see a rising voice challenging this historical structure.